These are garments created over the years by Charlotte. 2008 Bernina Fashion Show garment made of silk with intricately pieced rectangles, featuring set in corners. 2006 Bernina Fashion Show garment. 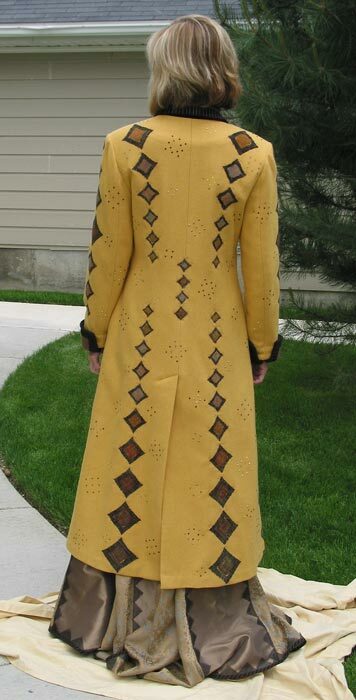 Coat features silk dupioni squares that have been felted into wool. Dress has faux prairie point edges. 2005 Bernina Fashion Show. This garment from 2005 was one of only 2 in the entire Fairfield and Bernina Shows that were made for men. It is white wool with digitized machine embroidery of drawings done by my son, Davyn Andersen. Red silk dupioni shirt also has embroidery. Creme de la creme award of the 2003 Bernina Fashion Show. Fabrics: Silk dupioni, silk habatoi, silk charmeuse and devorè satin. Construction techniques used: Computerized machine embroidery, foundation piecing, inverted sheer gores, 65 yards of bias binding. Fabrics: Cotton and rayon velvet, silk dupioni. Construction techniques used: Computerized machine embroidery, cord couched with decorative stitching, foundation piecing for yoke of camisole. Fabrics: Silk noil, silk jacquard. Construction techniques used: Decorative machine embroidery, fused machine applique, strip piecing. Fabrics: Wool, Ultrasuede, Polyester/metallic blend. Construction techniques used: wool raw edges blunted together then covered with Ultrasuede strips applied with a decorative stitch, strip piecing. Fabrics: Silk noil, lame, cotton plisse, ribbon. Construction techniques used: Fused machine applique, satin stitching, twisted ribbon faggoting. First Place - 1991 AQS/Hobbs Style Show. Fabrics: Wool, silk noil. Construction techniques used: Piecing to create fabric for body of coat, piecing to fit for collar and facing. 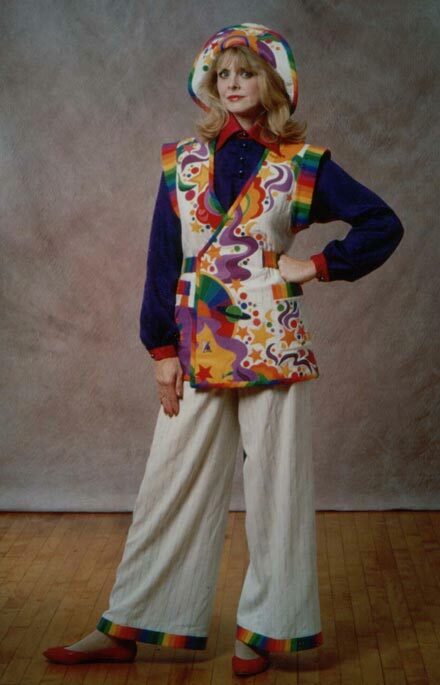 Second Place- 1990 AQS/Hobbs Style Show. Fabrics: Wool, polyester, Ultrasuede, leather, silk broadcloth, tapestry fabric. Construction techniques used: Hand and machine applique, both sides of tapestry fabric used, random free form stitching on skirt. Fabrics: Silks, silk noil, polyester, lame Construction. Techniques used: Piecing to fit, machine applique. Fabrics: Polyester ottoman, polyester dress fabric, lame. Construction techniques used: Strip piecing. Fabrics: Polyester. Construction techniques used: Strip piecing, inset squares.